Ew. Good thing the bathroom was pretty clean. But seriously, of all the places to fall asleep. 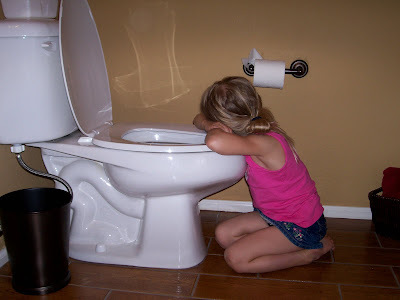 Where's the strangest place your kids have ever fallen asleep? Hahaha!! That's funny!! Poor thing she must have been really tired!! Glad you found your About me page! When you finish it let me know and I help you link it up!! I remember falling asleep on the stairs when I was a child. My parents woke up and there I was -- asleep.